Who doesn’t love ice cream? It’s sweet, delicious and refreshing. Frozen yet creamy. It’s no wonder that Americans consume more than 20 litres (about 42 pints) each a year(!). I love ice cream. I’m the kind of person that would eat ice cream at any time, no matter the weather. You could dunk me into a frozen lake and then ask me if I’d like some ice cream and I’d probably say yes. If I have to die of hypothermia, I might as well do it while eating ice cream. But what is ice cream? What is it made of? And who invented it? We’re not entirely sure how ice cream was invented or by whom. The earliest evidence of iced food is from a couple of thousand years ago: the Persians used to eat grape juice mixed with ice. 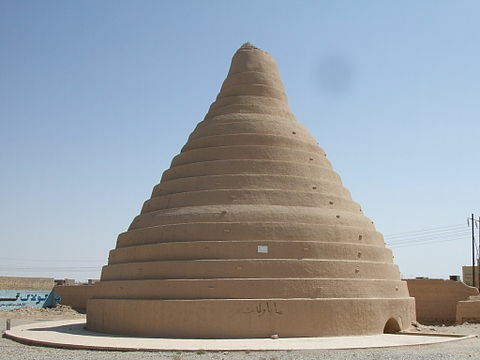 The ice was stored in specially built cooling evaporators the size of a small building called yakhchals. The Romans also enjoyed mixing fruit juices with ice taken from the mountains. But, to get from the precursors of the modern granita (or other iced drinks, like the frappuccino) to proper ice cream took more than a thousand years. There are several myths on the origin of ice cream. 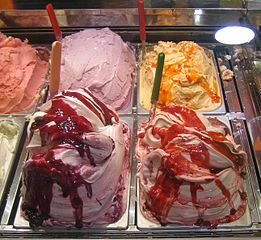 Some say that Marco Polo witnessed ice creams being made on one of his trips to China and then introduced them to Italy. A version of this myth involves the Mongol riders taking provisions of cream in animal-skin satchels. During the winter, in the sub-freezing temperatures of the steppe, the galloping of the horses churned the cream and turned it into ice cream. As the Mongols conquered China, this knowledge spread and was well known by the time of Marco Polo’s little jaunt to Cathay. Other accounts tell the tale of a cook under Charles I inventing ice cream. Charles then offering the cook a lifetime pension in exchange for never giving up the recipe to the royal treat. These, however, are just myths. There is no historical evidence giving them any credence. 1. Cooling food and drink by mixing it with snow or ice. 2. The discovery that dissolving salts in water produces cooling. 3. The discovery (and spread of knowledge) that mixing salts and snow or ice cools even further. 4. The invention of the ice cream maker in the mid-19th century. 5. The development of mechanical refrigeration in the late 19th and early 20th centuries. There are no chemical reactions involved in making ice cream, but plenty of physical ones. At its core ice cream is what the name implies: very cold dairy cream. However, if we were to freeze pure cream it would just become a big, hard block of frozen dairy. To avoid this sugar is added to the cream. What sugar does is decrease the melting point of the mixture. By decreasing the melting point it is possible to have a solution of milk and ice with partially frozen water. The free liquid water contributes enormously to the creamy texture of ice cream. However, this causes an issue. Since the melting point of the cream and sugar mixture is lower than that of water we can’t simply use ice to freeze it. Ice, on its own, is stuck at a temperature of 0 degrees Celsius (32 Fahrenheit). The cream and sugar mix needs to be cooled far below that. If we were to place some cream and sugar in a container, and then submerge the container in a simple bath of ice and water, ice cream is never going to form. Which brings us to an important discovery in the realm of refrigeration: there is a way to make ice water colder than zero degrees centigrade. By adding salt. Anyone who lives in a cold climate will probably be very familiar with the effect of salt on ice. Salt is used to melt snow or ice on pavements and roads. So, if salt is added to an ice bath, it decreases its melting point. A saturated solution of ice and salt will reach a temperature of -21.1 degrees Celsius (-6 F). It is then possible to use this salted ice bath , which is at a sub-zero temperature, to freeze cream and sugar. There is a detailed description of the effect of salt on ice in an Arabic medical textbook from 1242. Around the same period a book was also published containing recipes for sorbets. This knowledge eventually spread to Italy. In the late 16th century, a Neapolitan scientist called Giambattista Della Porta “discovered” the cooling effect of a salted ice bath. This knowledge spread around Europe and by the mid-17th century it was not uncommon to be served frozen ice desserts at banquets. These desserts were still more granita-like and lacked the cream that gives the name to my favourite treat. The first written mentions of ice cream as frozen dairy appear around the end of the 17th century. Ice cream was served at a feast in Windsor in 1671 (though only at Charles II’s table). You must take sweet cream, and put thereto two handfuls of powdered sugar, and take petals of orange flowers and mince them small, and put them in your cream… and put all into a pot, and put your pot in a wine cooler; and you must take ice, crush it well and put a bed of it with a handful of salt at the bottom of the cooler before putting in the pot… And you must continue putting a layer of ice and a handful of salt, until the cooler is full and the pot covered, and you must put it in the coolest place you can find, and you must shake it from time to time for fear it will freeze into a solid lump of ice. It will take about two hours. Take a chopine of sweet cream and the same of milk, half a pound of powdered sugar, stir in three egg yolks and boil until it becomes like a thin porridge; take it from the fire and pour it into your ice mould, and put in the ice for three hours; and when it is firm, withdraw the mold, and warm it a little, in order more easily to turn out your cheese, or else dip your mould for a moment in hot water, then serve it in a compôtier. The recipes in the sidebar show a development from the simple ice and flavouring mixtures to more complex ones involving dairy cream. Another recipe from the time detailed the ultra-rich glace au beurre — literally iced butter — which involved 40 egg yolks per litre of cream! Another important development was the realisation that constant stirring of the sugar and cream mix would decrease the size of the ice crystals. As we’ll see later, this is fundamental to the creamy texture of ice-cream. The next big step involves a woman called Nancy Johnson, who lived in Philadelphia in the 19th century. In 1843 she was awarded a patent for the first mechanised ice-cream maker. Until then ice-cream had to be made by hand and in small batches. It was a tedious, laborious and inefficient process. Johnson’s ice-cream maker was composed of a bucket to hold the salt and ice and a sealed cylinder for the ice cream mix. The mix could be continuously stirred by a hand-cranked rotating spatula. The beginning of the mass production of ice cream is usually attributed to Jacob Fussell, a Baltimore milk dealer, who started using his seasonal surplus of cream to make ice cream on a grand scale, which allowed him to sell it at a far lower price. He founded the first ice cream factory in 1851 in Baltimore before expanding to New York, Washington and Boston. The advent of modern refrigeration increased the mass availability of ice cream. In fact, modern industrial ice cream freezers are not that different from the Johnson-Young machine. They still have a barrel with a rotating scraper enclosed in a cooling bath. However, the coolants used have a lower temperature than ice and salt (liquid ammonia, an often used one, has a temperature of -30 C, almost 10 degrees lower than a salted ice bath) and the barrel in which the ice cream is formed is now horizontal rather than vertical and allows for continuous use. Ice cream mix is pumped in at one end and ice cream is pumped out at the other. Since the rate of cooling is dependent on the difference between the temperature of the mix and the coolant, the lower temperature of the coolant allows faster cooling. This produces smaller ice crystals which improves texture. In fact, some restaurants offer almost-instant ice cream, made right at your table by using liquid nitrogen. As liquid nitrogen has a ridiculously low temperature (-196 C to be exact), the ice cream mix turns into ice cream almost instantly. 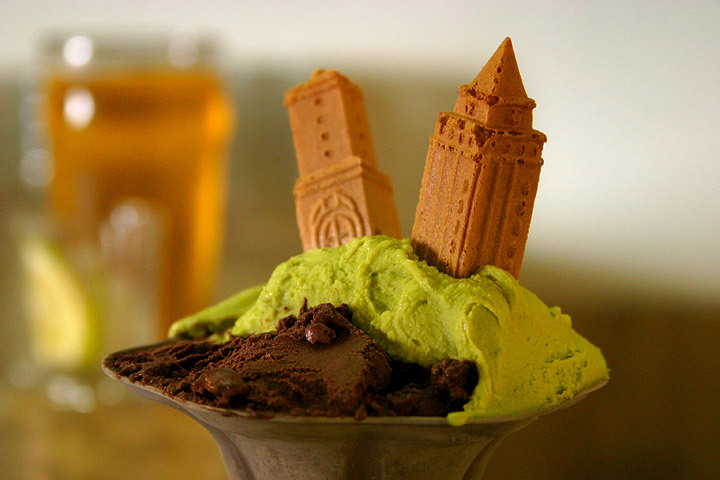 Artisanal ice cream, like the gelato found in many Italian ice cream parlours, is still made in a batch process. The industrialisation of ice cream provided several refinements (though some might say that not all were positive ones). To achieve more and more smoothness of texture, manufacturers began to add other ingredients such as gelatin or powdered milk. Manufacturers began to add stabilisers to ice cream to ensure minimal texture disruption during transport in home freezers, which are much less stable and reliable than industrial ones. Other modern ice cream additives include emulsifiers, flavourings and colourants. 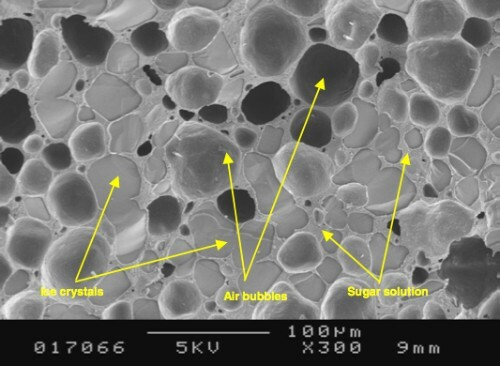 (More on stabilisers and emulsifiers in the next section where we’ll have a look at the structure of ice cream). One definitely positive effect of industrialisation is the widespread use of pasteurisation, which vastly reduces the risk of spoilage and makes ice cream a safer food. Ice cream, at its most basic, is composed of three elements: air bubbles created by the mixing and churning, ice crystals made of pure water, and concentrated cream that is formed as the water in the cream turns into the crystals. It is both an emulsion (a mixture of water and fat) and a foam. In fact, it contains all three states of matter: solid, liquid and gas. But first, let’s have a look at the fundamental ingredient of ice cream: cream. Cream is milk that has been enriched with fat. Traditionally this process occurs naturally under the action of gravity. If milk is left to sit for a few days, the fat globules in milk will rise and form a layer at the top of the container (fat is lighter than water). This layer can be then skimmed off and either used as cream or churned to make butter. These days cream is separated from milk using centrifuges. Compared to milk, which has about equal amounts of protein and fat, cream is much fattier and richer: it has about 10 parts of fat to 1 of protein. The fat in milk and cream is suspended into globules. A membrane of phospholipids covers each globule. Phospholipids are emulsifiers and allow the fat to be soluble in water as well as keeping the globules from sticking to each other. When cream is churned, these membranes are broken and the fat can pool into a large mass: butter. Let’s get back to the micro-structure of ice cream. Ice crystals form from the water in the cream as the mix is frozen. The size of the crystals determines the smoothness of the ice cream. Large crystals will give the ice cream a coarse and grainy texture. About three quarters of the water in the mix is frozen into crystals at -18 C (0 F). The rest of the water forms a highly saturated thick liquid solution with sugars, milk proteins and stabilisers (if used). This solution forms a matrix in which the other particles are suspended. Air bubbles are introduced into the ice cream via mixing and, in some industrial processes, by directly injecting air during the freezing. Air is fundamental as it disrupts the matrix formed by the ice crystals and the cream. It makes the ice cream easier to scoop and bite into. The increase in volume due to the air bubbles is called the overrun and is measured as a percentage of the original mix volume. Obviously, the higher the overrun the less dense the ice cream. 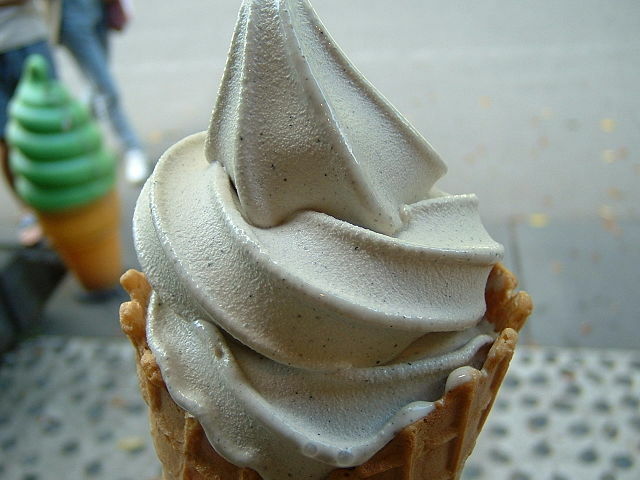 Soft-serve ice cream, for example, has an overrun of as much as 100%. Artisanal ice creams tend to to have a much lower quantity of air. Finally, the fat globules from the concentrated cream provide stability to the air bubbles and prevent their collaps, much like they do in whipped cream. They also provide plenty of creaminess and flavour. 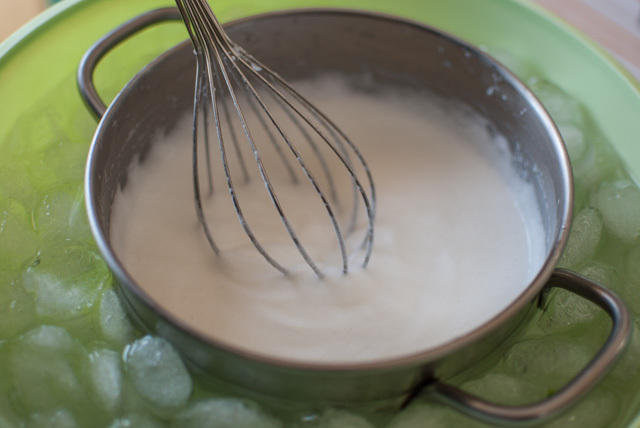 Other emulsifiers can also be added to the mix to improve the stability of ice cream. Egg yolk is also sometimes used as an emulsifier and also to add flavour. For example, “base gialla” is an Italian ice cream base which contains eggs. Stabilisers are large molecules that increase the viscosity of ice cream. This has several beneficial effects including increasing the perceived smoothness of ice cream in the mouth, reducing the rate of melting, increasing the stability of the foam as well as increasing the ease of pumping ice cream in an industrial setting. Too much stabiliser and the ice cream will be too firm and chewy. 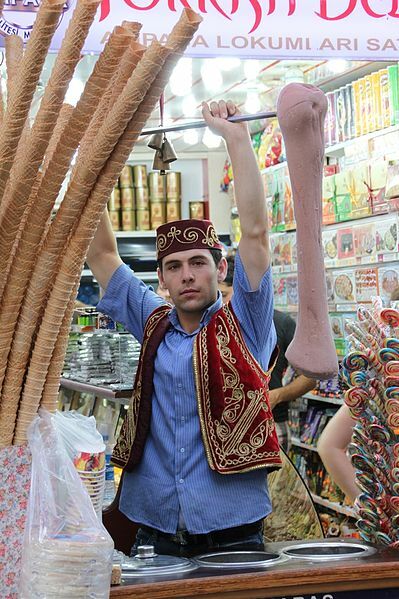 However, sometimes this may be desirable: chewy Turkish ice cream is made with the addition of a natural stabilisers. Thawing and refreezing ice cream causes the ice crystals to increase in size as they melt, coalesce and reform. Poorly stored and transported ice cream will have a very coarse and unpleasant texture. It’s always disappointing to buy ice cream at a supermarket only to find it composed of large crunchy crystals. In my experience I’ve found that different supermarkets and shops treat their ice cream with different levels of care and I avoid buying it from those I don’t trust. To make good ice cream one must consider the delicate balance of all the ingredients and how they affect the micro-structure. The less water in the mix the easier it is to make smoother ice cream. But if there is too much sugar the ice cream might end up syrupy as well as increasing the risk of sugars crystallising (which give an unpleasant texture). Too much fat and the mixing action may cause it to churn into butter. Industrial ice cream is made by first preparing the mix with the desired balance of milk solids, fat, water and additives. Then it is frozen in an industrial freezer which often also introduces air bubbles by injection. As the mix gets colder so does its viscosity. There comes a point at which the heat introduced by the mixing blades is equal to that taken away by the coolant (around -5 C). At this stage the ice cream can’t be cooled any more by the freezer and only half of the water is frozen. The ice cream is quickly extruded and hardened, often by blowing -40 C air on it. During this process some of the liquid water migrates to the already formed ice crystals. The ice cream can then be packaged or formed into a variety of shapes and confections. Keeping ice cream in a home freezer for a long time can alter its structure and flavour. Home freezers are sometimes not very stable: their internal temperature can fluctuate. This can cause the growth of ice crystals. It’s also possible for the fat in the ice cream to absorb off-flavours from other items in the freezers and, if dried out by the air in the freezer, can also go rancid. It’s best to store ice cream at temperatures of at least -18 C (0 F) which is a typical home freezer temperature. Industrial cold stores are usually around -25 C.
When serving ice cream, it’s best to wait a little while. At a warmer temperature of -13 C the ice cream is softer (and easier to scoop). At -18 C taste buds are numbed by the cold temperature of the ice cream and can pick up less flavour. Waiting for the ice cream to thaw a bit can thus improve taste. As I was researching this article I had the idea of making ice cream at home the old-fashioned way. I don’t own an ice cream machine, but really, at its core ice cream is just milk, cream and sugar. How hard can it be? (I mean, I’ve only just spent several thousand words describing the complexity of ice cream). The project was doomed from the start. My trusty kitchen thermometer decided to take an announced vacation and measured the unsalted ice bath as a balmy 22 degrees Celsius instead of the expected 0 C. Fantastic. It meant I could’t measure how cold my salted ice bath was or if my ice cream mix was getting colder. Undeterred, I poured about 4 trays of ice cubes into a salad bowl and added a little water and a LOT of salt. 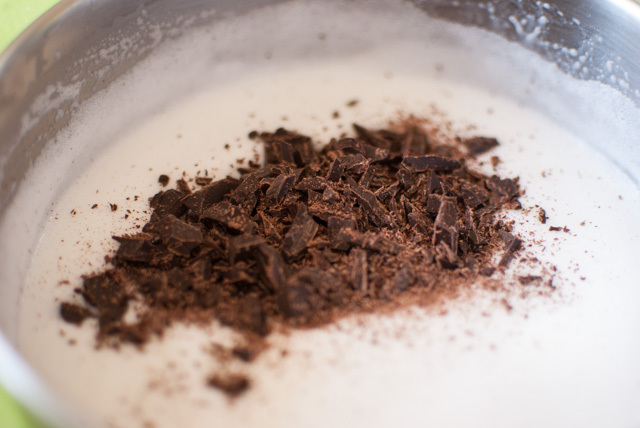 Then I mixed about 500 grams of milk, 100 g of cream and 150 g of granulated sugar and poured it into a metal pot. I was trying to make an “Italian-style” ice cream, with fat content around 6-7%. b) using egg yolk would require heating the mixture up to pasteurise it and I could not really be bothered (and I wouldn’t have been able to measure the temperature anyway, stupid broken thermometer). I placed the metal pot in the ice bath and started whisking. Within seconds, much like a marriage to a stripper in Las Vegas, I realised that this was not going to work out. There is far too much ice cream mix. It would take forever and far more ice to freeze it all. I decided to pour half of the mix into an ice cube tray and placed it in the freezer. At least I would have something to compare it to once I’m done. I used ice-cube trays because I figured that thanks to the increased surface area the mix should freeze faster than if i just froze it in a big bowl. Faster freezing should mean smaller crystals. I kept on working on the mix in the metal pot. I whisked, I stirred vigorously. At some point, it looked like it was getting a bit thicker but I couldn’t really tell for sure. I added more ice, more salt and keep whisking. Nothing. Forty-five minutes in, all I had was boredom, a sore wrist and a metal pot with some slightly cold sugary milk. Boredom won out and I decided to mix in some chopped chocolate and pour what I have into another ice-cube tray and stick it in the freezer. A couple of hours later, the moment of truth. 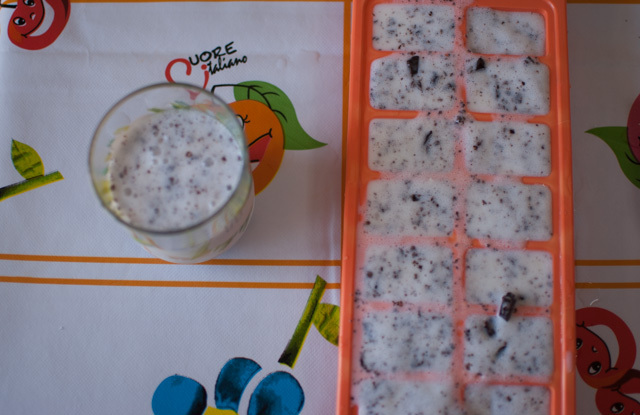 Have you ever had milk ice cubes? Because that is exactly what I made. It actually tastes quite nice. Milky and sugary. It’s a shame that the crystals are enormous. It’s not creamy or chewy at all. I do find another use for the “ice-cream” cubes. They make a pretty good iced cappuccino. There is a reason why we use emulsifiers and stabilisers in ice cream. An ice bath is useless if you can’t tell how cold it is. Making ice cream is more difficult than just freezing some milk, cream and sugar. Don’t let my misadventure dissuade you from making ice cream at home. With a little more preparation and care it’s definitely possible. Also, now I’m hungry for ice cream.